1. We are notified by OEC that they are not integrating their technology with optionsXpress. 2. Gain Capital has acquired OEC from optionsXpress. 3. Remoting is no longer necessary when you run OEC Trader and NeoTicker side by side. Will keep you all posted on this exciting new update. Open E Cry has been working on a major revision to their API since their integration with OptionExpress. We have been working on their new API for a while and here are some great news. First, the new individual symbol request capability from their feed means better control of what symbol you stream from them and reduced CPU load. Second, remoting is now some what functional means you can start NeoTicker connected to their server, then start the OEC Trader app to run alongside NeoTicker. You get to keep all the order placement features you like with OEC Trader and having NeoTicker handling the complex analytics. OEC does not provide us with an official release date yet for the new API. Whenever they are ready to release that, NeoTicker will have the order server ready too. 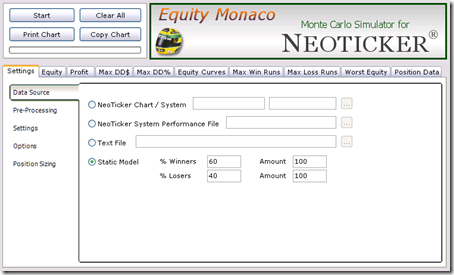 The latest release of Equity Monaco sports a new user interface that reduces clutters and a new option for quick visualization of simple trading models defined by static statistics. 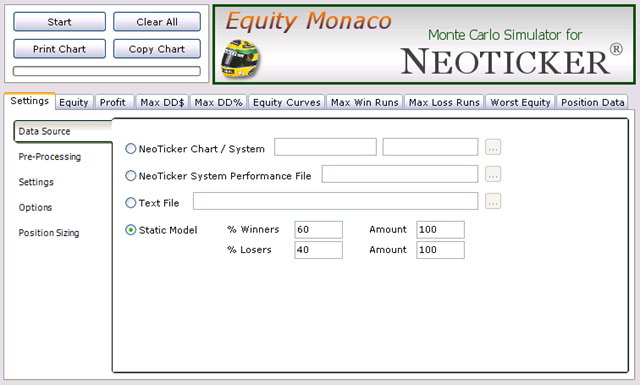 Here is a screenshot of the new Equity Monaco. The new static model option is a very useful tool. For those interested in learning trading system design, it can help them understand the basics and importance of monte carlo simulation on trading models without building an actual model first. For those discretionary traders who want to improve their money management techniques but cannot grasp the impact of various position sizing methods, the static model option offers a way to find the answers visually. By entering the exact winning/losing percentage and their corresponding average winning/losing amounts, one can generate the desired information quickly. For example, using the setting of 60% winners and 40% losers, where in both cases the amounts are $100, we find that the terminal equity is very likely (statistically speaking) that it will end up doubling the initial capital of $10,000. Remember Equity Monaco is free. You can get it here. Before summer started, my son was learning probability at school and his teacher gave his class some interesting questions to solve. The background is that they’ve just learned fraction, decimal numbers, etc. It is best to use direct connection (i.e. with ethernet cable and all that) over Wi-Fi connection, because it can remove one potential cause of disconnect easily. Interference within your home can sometimes disconnect your computer from the Internet. For example, there are some wireless home phone that, when in use, can drop your computer’s Wi-Fi connection quality significantly. If you experience data lag or disconnect when you are on the phone, then see if you can move the base of the wireless home phone away from the computer to improve the situation. One of the very rare calendar date based statistical bias happens on April’s Fool. No joke! March 30 and March 31 each date produces an accumulated -15% return (non-compound, close to close) on Dow or S&P 500. Then on April’s Fool, a whooping +15%. It is not the strongest performer in terms of calendar date bias, but definitely enabling the market to wipe out the losses made in the 2 prior trading days. Maybe the stock market likes to pull a prank on its players too. Note: Data collected over the past 50 to 60 years. We have worked with many clients to setup their computers to work better with real-time data streaming and trading purposes. Here are some tips (and funny stories) that work very well to maintain your internet connections in prime condition. Managing your subscription with eSignal sometimes can be confusing. Here is some tips and information that are useful for both new and long time subscribers of their services. Some data feeds (including eSignal several years ago) automatically provide delay data for exchanges you have not signed up for real-time streaming. Due to the fact that eSignal has grown into an international data provider, there are way too much data to send out on all exchanges that you have not subscribed to. During the first and last trading hour when the US stock market opens, some limitation to the amount of historical data you can download is imposed. If you expected to load a lot of historical data, especially tick data, then it is better to do that before market open. For those traders interested in bid/ask analysis, it is important to know that you need real-time subscription to get historical tick data that includes the bid/ask data. If you do not have the subscription, the historical tick data you download would include the trade data only. eSignal has not added this option to their API, thus 3rd party applications cannot access those extra historical minute data even if you can see them within eSignal’s own software. An example of using the Cone Projection indicator in real-life. Emini S&P 5-minute with 100 days of data loaded. Cone Projection parameter using daily break, lookback period of 90. What does the indicator do? It utilizes the moving average by step indicator to figure out the potential high/low at any point in time at the chosen break period. In our example, it figures out how far on average the price would move from open of the day to any particular point in time. The red lines are the averages and the blue lines are 1 standard deviation away. The indicator provides a projected path of support and resistance over time based on your break criteria. In the example, the projection is based on Day break, thus you can see the projection for the whole trading day beforehand. For a range bounded day, travelling from one end of the average to the other often signal completion of a move, as illustrated by the 2nd and 3rd day in the chart. For a trending day, the market will stay between the average and the one deviation zone, as in the first day shown in the screenshot.